If eating heart-healthy is on your radar–and even if it’s not–you’ll want to try these delicious Oatmeal Muffins. We’re talking about moist and flavorful bites of yum all dished up in a little muffin cup. And since you know food that comes in (nearly) bite-size bits is always good, you can pretty much guarantee this treat will be no different. We’ve made–and tried–a LOT of muffins. A few of our favorites have been Perfect Banana Muffins, Pumpkin Oatmeal Chocolate Chip Muffins, Cinnamon Applesauce Crunch Muffins and Best Blueberry Muffins. If your household is anything like most other households, mornings are hectic. Whether you’re in a hurry to get to work or school–or both–muffins make a quick morning meal that is easy to grab and go. Which really means that we should start making them more in our house, because we’re always running out the door at close to the last minute in the morning. A few of us are NOT morning people. 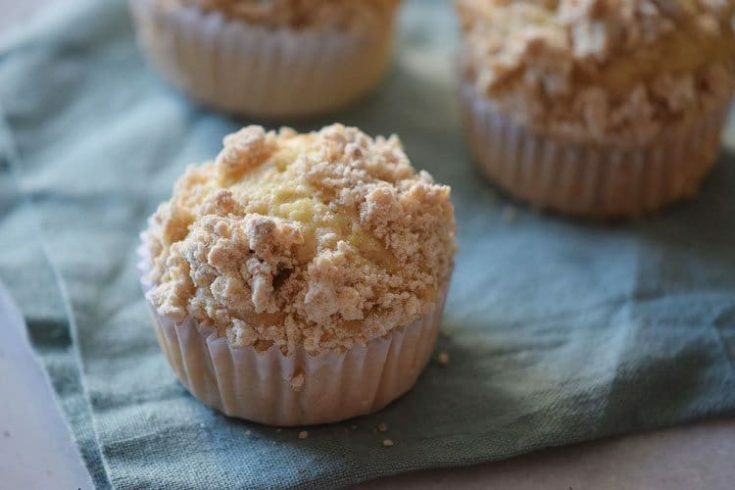 These Oatmeal Muffins will surely hit the spot if you’re craving a little afternoon snack . Slice one open and top with some Homemade Strawberry Jam, which is utterly scrumptious. Or, you could use a cupcake injector and add jam or another yummy filling into the muffins. We’re thinking nutella or an apple butter would be exceptional. If you’re looking for another school lunch idea, these muffins are a delicious surprise to pack in your child’s lunch. Whether you serve up these tasty muffins as is, or fill them with a fun surprise, this recipe is a winner every single time. So, preheat your oven and put your apron on. It’s time to get baking! Mix in a bowl the flour, 3/4 cup oats, 1 1/2 cup milk, sugar, baking powder, salt, butter, and eggs. In a small bowl, combine the remaining milk, oats, granulated sugar, and cornstarch. Fill muffin liners with the first batter, top with the second oats mixture, and place in the oven. When ready, remove from the oven and let the muffins cool down. Tips: If you are feeling extra indulgent, top the muffins with some chocolate glaze drizzles.